A Dose of Venom: Symbiote Mash-Ups: The Powerful, the Silly, and the What in the World Were They Thinking? Symbiote Mash-Ups: The Powerful, the Silly, and the What in the World Were They Thinking? Over the many of years of symbiotes being relevant in Marvel and the crazy places Marvel went in the '90s and '00s, some of the most obscure and cool ideas have been used to bring symbiotes into the spotlight of other heroes and villains. Whether it be for power or downright ridiculousness, the symbiote bond is strong and puts interesting spins on different characters. Let's start with some of the powerful and weird people/entities in Marvel that symbiotes have bonded with. Though this is not a real bond and was an illusion created by Mysterio, this seems to be the end all, be all for powerful symbiotes. 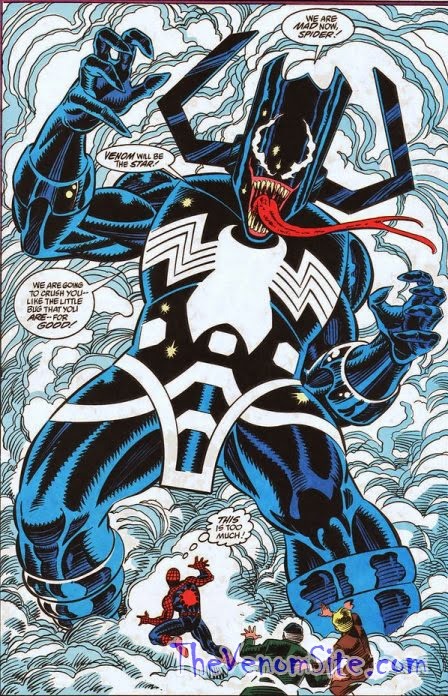 The pure control Venom could have on the Marvel Universe would be almost infinite. This is all in fun and imagination, though the chances of Venom actually taking over a superior being like Galactus are slim. Though the superior being Galactus was not bonded, his past herald was victim to the parasite known as Carnage. 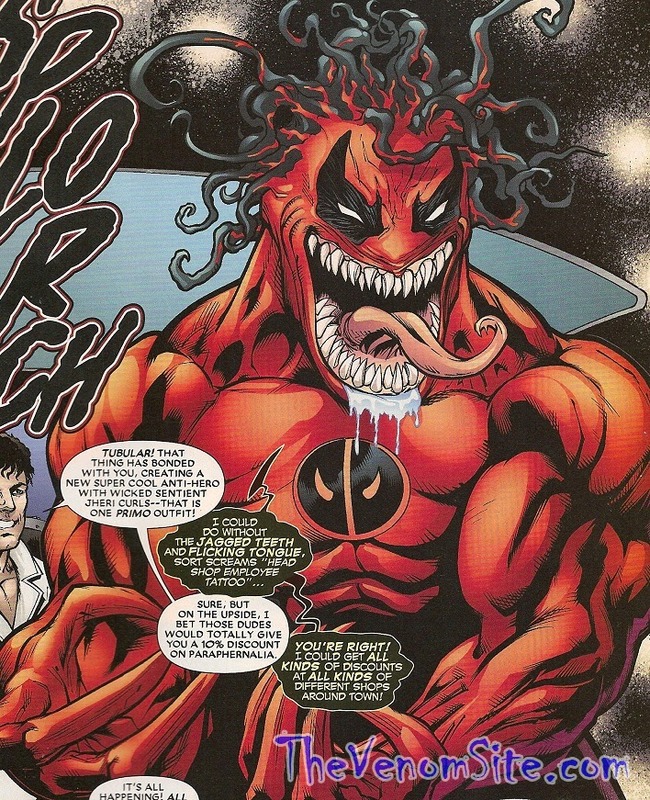 A being like Surfer controlled by a psychopathic symbiote like Carnage can only spell CHAOS. Though this two-part appearance was short-lived, to this day it is considered one of the most unique bonds of hero and symbiote. 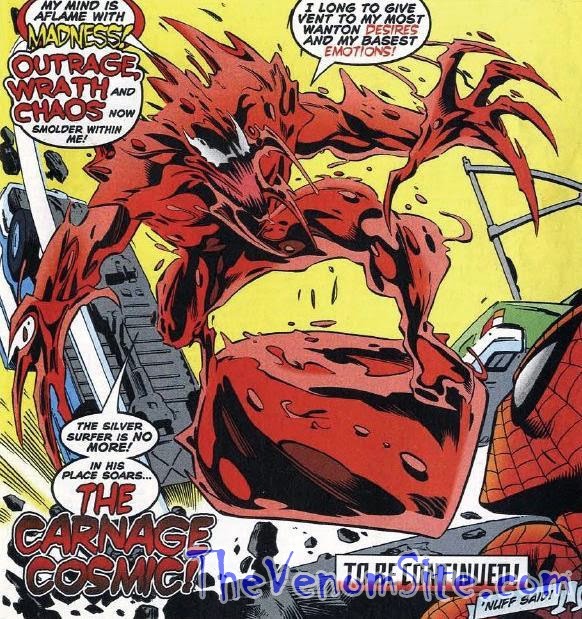 In the '90s, the height of symbiote popularity was rising and with the new Carnage symbiote being introduced and taking the front stage, this event allowed us to see the full capabilities of a symbiote with what it could and couldn't do as a parasite. We learned that almost everyone is vulnerable to the bond of a symbiote, even the Silver Surfer. This can go down as powerful or weird, but in the recent Flash Thompson Venom series a radical combination happened. Red Hulk took on the symbiote and the Ghost Rider's Spirit of Vengeance to create one of the weirdest and theoretically most powerful symbiote combinations ever to exist. The idea seems crazy, but the art speaks for itself when it screams COOL! This had to be most '90s fanboy dream bond, but in April of 2011 it came true. The Deadpool character has skyrocketed in popularity and what could be more cool than both of the '90s biggest anti-heroes getting a comic together? Riddled with jokes and typical Deadpool actions, it did not seem as though Venom would fit in Wade Wilson's persona; but as you can see in the panel, some things did work out. 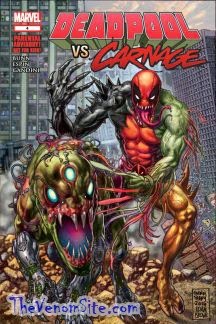 Recently, Deadpool accepted aid from the highly unlikely group of symbiotes known as the Mercury Team in a challenge to fight and understand Carnage in the limited series Deadpool vs. Carnage. We can see that there is still a future for symbiotes and Deadpool. There have been many others who have worn the symbiote from the Avengers to the Kingpin (in the future), but all have equally different stories. The symbiotes will forever be bonding for many decades to come. All that is left is just time to find out…who is next? Check out the new Guardians of the Galaxy: Planet Venom story arc coming soon to find out just who is next. What are some of your favorite bonds? Who do you think could benefit from the symbiote? Comment below and let me know who or what you think should be next on the parasitic agenda.